No Fenders -Formula 1, IndyCar and A Whole lot more..: R100: Pacific Northwest Drivers with Speedway Connections..
R100: Pacific Northwest Drivers with Speedway Connections.. It's funny to Mwah, how hard I-T is regarding discerning history of simply a century ago in regards to motor racing in general, which surely means finding information upon Thy Pacific Northwest, known more for its green forests resplendent with Douglas Firs and other magnificent conifers even harder to unearth. Which leads to most probably only being able to name two current-day Roundy-round TAxicab Drivers named Kasey Kahne and Greg Biffle from the state of Washington. Local Boy Done Good Again! And whilst Portland may have the jump upon both Indianapolis and Washington, motor racing did come to Tacoma in the early 1910's, when racing upon a five-mile Dirt Track commenced in 1912 in Lakewood, WA, a suburb of "the City of Destiny," aka Tacoma, Washington. With the inaugural race winner being Eddie Pullen who later won the 1914 American Grand Prize - Claiming his maiden AAA National Champ Car victory on July 5, 1912. Several more races were held upon Tacoma's Dirt Track which continuously changed in decreasing length between 1912-14, with today's Dirt-track's remnants being public roads. In 1915 the race moved to Tacoma Speedway proper, a two-mile Boardtrack with a dubious reputation to say the least. With drivers of the Day unanimously saying "Boardtracks in general were rough, and then there's Tacoma!" All of the B-I-G' Names came to Tacoma, notably Barney Oldfield, Ralph Mulford and Washington's very own Joe Thomas. While such luminary drivers as Eddie Rickenbacker, Tommy Milton and Jimmy Murphy were all victorious on the devilish Boardtrack before its ultimate demise in 1922. Although subsequent searching claims he was from Grays Harbour, WA, a body of water north of the "Mighty Columbia" (River) on the Washington-Oregon border. With the nearby Chehalis River's eastern mouth feeding into Grays Harbour - where the city that Nirvana's Kurt Cobain grew up in, Aberdeen's located. While the Harbour itself was discovered by Robert Gray in 1792! Joe apparently was a promising driver, reportedly winning at both Fresno and Beverly Hills Boardtracks in 1921, his best year in racing before subsequently being Blackmailed to work for a gang of Automobile Thief's who threatened to kill his family between 1926-27 before going Bankrupt after reporting this threat to the authorities! Purchased from Frank Kurtis's race shop in California and prepared over the winter of 1947, representing The City of Destiny, (Tacoma) local Hal Cole chauffeured the Roadster at Indianapolis in the first of its two race outings. row in 1949 before mechanical problems forced it out of the race. Interestingly, Cole made his rookie debut at Mother Speedway in a Don Lee Alfa Romeo in 1946, starting from the inside of Row-2 before retiring on Lap-18 with a Fuel leak. As I've only learned of Lee's name now, who reportedly made a vast fortune as a radio station Magnate in California, along with being the state's exclusive Cadillac dealer! And naturally, used racing as a way of promoting his product with a vast cadre of drivers including the likes of Duke Nalon. Cole's best finish at Indianapolis appropriately came aboard his Hometown's racing car, and excellent sixth place finish. Meanwhile, his final start, contrary to Zed Internetz' came in '49, when Cole finished an unheralded 19th aboard the Gancor Kurtis-Offy entry - and subsequently died from a Heart attack just prior to his 58th birthday. 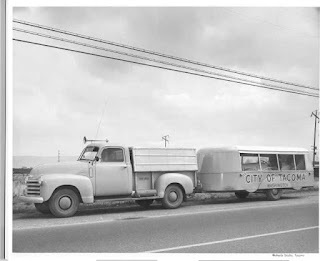 And as mentioned above, in 1949 Jack McGrath drove the City of Tacoma Special, placing the Kurtis Kraft (KK2000) Roadster on the outside of Row-1! As perhaps Y'all have heard of McGrath? As he staged an epic duel with somebody named Bill Vukovich in the 1955 Indy 500, retiring shortly before the elder Vukovich perished later in the race. Another driver from the Roadster era I know nothing about, other than he was born in a city in Oregon which I've also never heard of. Amick was part of the Midget Racing scene sweeping the Pacific Northwest during the Post-war era, before switching to USAC competition, finishing in the Top-10 in all three seasons of USAC Midget Car racing - having won the '57 Turkey Night Grand Prix. Amick then shot to fame in his lone IndyCar start at Indianapolis, after apparently having failed to qualify the previous year. Driving a new fangled "laydown" racecar, he finished a comfortable runner-up to 1958 winner Jimmy Bryan as a rookie! Meanwhile, presumably hoping to reap some notoriety a la its Seester' city Tacoma had done two decades earlier. a driver who'd later become known as Lonestar JR' qualified the (1968 entry) City of Seattle No. 18 Eagle-Ford to a relatively quiet P21. Then ironically he was classified 18th after a single-car collision on Lap-125 while symbiotically Oregonian transplant and good friend Art Pollard was piloting the lone STP Lotus 56 Turbine to finish the full race distance in P13. For Thy epic conclusion to this two-part harmony, see; R100: Pacific Northwest Drivers with Speedway Connections - Fini!